PBKiteboarding.com is the only kiteboarding gear, kitesurfing gear, kite shop, equipment & kite store kite snowboarding, snowkiting & kite skiing kite shop 5 to 10min from downtown Toronto GTA, Cherry Beach & Woodbine Beach, Lake Ontario. Buy your kiteboarding kitesurfing kitesurf kites Kiteboards and gear from PBK and pick up in Toronto or have us ship your kiteboarding gear across Canada, USA or Worldwide. Give us a call for kiteboarding lessons and kiteboarding gear. See some of our Customers on the PBK Youtube Channel. Check out the Full Selection of Ozone Water Kites! See our kiteboarding youtube videos here: PBK kiteboarding videos are shot right here in Toronto Ontario at Cherry Beach, Woodbine Beach and the Ashbridges Bay area in Toronto east. PBKiteboarding is 5 minutes from Cherry Beach & Woodbine Beach. We are only 5 to 10 minutes from downtown Toronto GTA. Our beaches are some of the best places to do kitesurfing & kiteboarding in Canada. We also provide kiteboarding lessons for customer at Cherry Beach. We kite at various spots for kiteboarding and kitesurfing in Toronto Ontario, depending on the wind direction and wind speed. We have learned a great deal about this sport since 2004. The wind in Toronto and the GTA is generally lighter in the summer and windier in spring and fall. During winter. We have great locations for snowkiting. Kitesurfing with skis and snowboards during winter happens to be the windiest time of the year. Have a look at this aerial drone video of Cherry Beach, by PBK. PBK has you covered and is a One Stop Shop including kite repair and certified kiteboarding lessons. Check out the Full Selection of Ozone Land and Snow Kites! Getting the best information about kiteboarding, kitesurfing & snowkiting is very important. 85% of the sport is actually about flying the kite, compared to 15% for the board or skis. If you want to learn on your own. It's best to get a trainer kite, like the Ozone Ignition V2 3 line kite. You can start learning how to kite anytime of the year. Late fall and early spring can be a fine time to take your first kiting lesson, PBK1 or PBKS1. 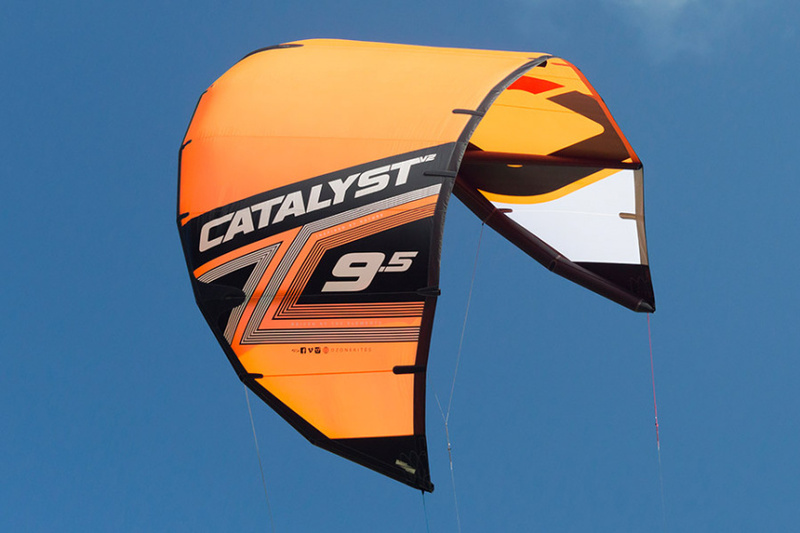 When ready to move to a bigger kitesurf kite, we have a great selection of inflatable, open cell and closed cell kites. At PBK, we know kites! Kiteboarding is one of the latest water sports! We sell the best inflatable and foil kites in Toronto and accross Canada & USA, such as Ozone Kites, Fone kiteboarding kites and many kiteboards and hydrofoils. The PBK Kite Shop also offer kite repairs and certified lessons to help ensure our customers enjoy the sport to its fullest! When I first got into kiteboarding and kitesurfing in Toronto. I bought my kites and discovered that kiteboarding was not as easy as it looked! Even though I had been windsurfing or sailboarding for years. I was also a certified windsurfing instructor and an avid waterman. I found that the place that I got my kites from, was not very good at supporting my journey into kiteboarding. As well, I was at a loss when I damaged my kite. The shop did not do kite repairs nor was able to offer any kind of support. My kite was unusable. In any case, this experience allowed me to start PBKiteboarding.com and finally help customers that needed the help, as I did back then. It has been very rewarding to see Customers succeed over the years with support from PBK as a ONE STOP KITEBOARDING SHOP! At PBK, our kiteboarding shop has been enjoyed helping 100's of Customers, many who have become happier than they've ever been in their lives. More smiles and becoming healthier than ever! The joy of kitesurfing & kiteboarding in Toronto Ontario Canada. How a kiter harnesses the power of the wind with a large controllable kiteboarding or kitesurfing power kite that is propelled across the water, land or snow. Join us for a rush with the wind! We also do Kite Snowboarding and Kite Skiing Lessons. All the Kite Gear you need to purchase from a One Stop Shop! Since 2004! The short answer is that kitesurfing was used earlier on in the sport since the first inflatable kite was invented in France where the name kitesurfing was used. Kitesurfing is still used more so in Europe than in North America. The sport was also being developed in the USA and the name kiteboarding was used. As the sport has developed, the name kiteboarding became more prevalent, however, kitesurfing gear is still very much used and the same as kiteboarding gear. At PBK the kiteboarding store / shop we enjoy helping customers with their kitesurfing equipment to kite board, kitesurf from the very beginning. Kiteboarding Toronto or kitesurfing Toronto. We provide all the kitesurfing gear for beginners and can guide you on your way to success with kitesurfing lessons for beginners and the best kiteboarding tips! Should you need a trainer kite - power kite to start off the safe way, with your kiteboarding training. A larger kitesurf kite for kiting on land or kite skiing or kite snowboarding on snow, small kites from 1.6m to large kites for water and snow up to 21 meters! PBKiteboarding can help! We also sell smaller items such a kite board fins and waist or seat harnesses as well. If you need a kite wind meter or sunglasses, we have that too! How to Buy Kiteboarding Gear? We have the most experience on selection and riding skills. We can put together a fantastic kiteboarding kites package for you. Looking for kitesurfing equipment for sale in Canada? If you are interested in kiteboarding gear for beginners, you've come to the right place. We help beginner kiters get started the right way, with a fantastic kiteboarding kit, professional kiteboarding lessons. If you are someone who might feel like giving up on Kiteboarding. Keep at it! contact PBKiteboarding.com for the best advice and the right kitesurfing gear from us. We'll try to help you out to rekindle your passion for the sport. When you get into kiteboarding canada, you can just have fun learning how to fly your powerkites, stunt kites on the beach sometimes called traction kiting. Kite flying for fun and get better flying your kite more often. This is a Fantastic way to learn. You could also simply start first by taking professional kite instruction from PBK. We also have a selection of instructional progression kitesurfing, kitesurf lessons dvds, beginner, intermediate and advanced kite lessons as well as a "how to snowkite dvd". With kitesurfing lessons, once you learn to rig, launch and land your kite properly and complete the self recue class PBK2, you'll later move on to body dragging the water and complete the PBK3 kiteboarding lesson, getting up on the board, you will eventually learn how to edge and carve your kiteboard, to kite upwind and be thrilled that you are now having some freeriding fun, able to go almost anywhere and not just downwind anymore. Kitesurfing in higher winds with a smaller kite can come later. As you add more kites to your kite quiver, you'll get more kiting days in. You might enjoy getting into freestyle, wakestyle kiteboarding and enjoy learning more tricks as time goes by. At PBK your kite Instructor can help you improve along the way once you've flown your kite more often. More kite flying is the safest way to continue learning the sport. Take lessons from PBK to get to the next level, we also teach twin tips kiteboarding big jumps with jumping lessons to maximize your skill and fun if you are excited about big air and hangtime and smooth landings. You can also get super stocked and take a kite loops lessons or learn to ride a foilboard (directional board) with straps or strapless hydrofoil kitesurfing lessons for the latest technical riding. We have deep water spots for Toronto kiteboarding & kitesurfing that are perfect for hydro foiling (Like a secret weapon to kitesurf lightwinds) and also some flat water kitesurfing cruising or waves at Woodbine beach for kitesurfing with a surfboard. You'll see surfers out there too. Once you start kiteboarding in Toronto, you'll notice how much fun it really is. Even if you don't live here, there are many places to for kitesurfing Ontario and surround area with our great lakes filled with fresh water. We also do Kiteboarding North of Toronto on Lake Simcoe, which is a fantastic spot to do all sorts of boardsports, boating and kiteboarding lessons. At PBKiteboarding.com, we have the best kiteboarding kitesurf gear in Canada, kites and kiteboards at our kite shop that will help you progress as quickly as possible and glide along flat water like a dream. We do this many days Kiteboarding in Toronto Ontario in lighter winds. See PBK in this Video Gopro Vids kiteboarding Toronto at Cherry Beach, which is a beautiful spot for watersports. When you get a new or used kiteboarding kite from PBK, it may be a leading edge inflatable kite with a bladder inside that you pump up or an open cell or closed cell foil kite that holds their shape with the help of bridle lines. Either way, we are very knowledgeable kiteboarding in Ontario and will help you choose a kite packages including helping with kite repairs when needed. Is kitesurfing easy to learn? It can be, however, the best place to learn to kitesurf is on the beach with a good trainer kite like the Ozone Ignition is the best beginner kiteboarding kite to learn on for hours of fun! The Ignition 3 line trainer kite is better than a 4 line trainer kite since it has less drag and can fly in lighter winds. Or, take kite flying lessons with PBK right here in Toronto. How much does it cost to get into kiteboarding in Canada USA? How long does it take to learn how do you kiteboard? It takes an average student with little or no experience approx. Kiteboarding Toronto requires 5-8 hours of professional instruction with ideal wind & water conditions to learn the basics. For a complete tuition (riding upwind) you will need around 20 hours. Kiteboarding Toronto, spring and fall are windier and gustier winds, with the winter being the windiest and sometimes gusty. We have sunny lightwind days in winter as well for wonderful Snowkiting, ski kitesurfing, kitesurf, kite skiing, kitesurf sailing with a snowboard in Ontario on Ozone Kites. To kite Toronto, It's always important to check the weather conditions before going kite boarding or snowkiting. It can get quite cold as the fall weather set in. We can get you into a cozy drysuit, or neoprene wetsuit, cold water gloves, hoods, helmet, floatation vests and booties for kiting in Toronto and to be ready to get some more time on the water in when it gets chilly for kiteboarding Canada. We can ship your gear right to your door or pick up in Toronto at our kite shop by appointment. Some kiters will travel for kiteboarding to place such as Cape Hatteras for downwinders. Other kiters might like kite boarding kite surf travel to tropical places like Cuba, Baja, Mexico, Cabarete maybe even Maui or kitesurfing in Costa Rica! kiteboarding la ventana. Kiteboarding Tarifa. In some case we can provide kite rentals such as in snowkiting with lessons. We also have a selection of used gear or demo gear for the rider to purchase from PBKiteboarding. snow kiting, kite snowkiting and kite skiing is easier that kite boarding and kitesurfing. All you really need is a trainer kite, skis or a snowboard for some inexpensive fun on a snow covered field or frozen lake. Kiters also can use a trainer kite or larger kite with a 3 wheel kite buggy, buggies or 4 wheel mountain boards, skateboards we can get for you for flat packed beaches or other terrain such as fields and parking lots and pathways. Kiteboarding kites do wear out over time. When you buy cheap kitesurfing gear or cheap kiteboarding packages that have been used allot, be prepared for having to do some repairs. When is comes to PBK Kite Repair we fix all sorts of power kites, ozone kites, Catalyst, Edge, C4, Alpha, Enduro, Frenzy, Subzero, Access, Explore, flysurfer kites, liquid force, core kites, cabrinha, contra, slingshot, north kiteboarding, rebel, naish, sail, switchblade, drifter, ocean rodeo kites, f one bandit kite, f one kiteboarding kites Canada. What is the difference between windsurfing and kiteboarding? Is kitesurfing an Olympic sport? The answer is yes, you can use a wakeboard, but it will have its limitations, this is why their are many dual directional kiteboards springing up on the market. ... With kiteboarding you are dealing more with variable speeds, especially in lower winds. This can cause these boards to stuff(nose of board goes under water). What is freestyle kiteboarding & kitesurfing? Kite surf kiteboards and wakeboards may share the same rectangular shape, but they are typically designed for different purposes. The main difference between a kiteboard and a wakeboard is in the rocker. ... Because it is considerably safer, and because kite tricks sometimes involve getting your feet off the board. The kite bridle is the arrangement of strings that go between a kite and the flying line. The bridle holds the kite at a certain angle to the flying line. It affects how the kite flies, and whether it flies at all. The point where the bridle attaches to the flying line is the tow point. What keeps a kite in the air? Lift, Weight, Drag, and Thrust) affect kites in the same way they affect airplanes, and anything else that flies. Lift is the upward force that pushes a kite into the air. Lift is generated by differences in air pressure, which are created by air in motion over the body of the kite. How do kites gain lift? The four forces of flight (i.e. Lift, Weight, Drag, and Thrust) affect kites in the same way they affect airplanes, and anything else that flies. Lift is the upward force that pushes a kite into the air. Lift is generated by differences in air pressure, which are created by air in motion over the body of the kite. When you ask for kiteboarding near me. If you are in Toronto, Canada or looking for kiteboarding USA. At PBK kiteboarding, we can easily ship a new kiteboarding kite, a used kiteboarding kite or kiteboard and kitesurfing gear. If you are looking for north kites for sale or need repairs on north kites. Contact us. If you are looking for kiteboarding lessons in Hamilton, kiteboarding lessons in Mississauga, kiteboarding lessons Oakville. Come to Toronto to learn.